Military and police remain the prime target market, but Inkas also hopes to expand civilian sales with the MPV. Editor's note: The name of an Inkas Armored Vehicle Manufacturing pickup is the Sentry APC. It was misidentified in a previous version of this story. OTTAWA — Inkas Armored Vehicle Manufacturing may not be Canada's biggest automaker, but it's easily the edgiest, building armoured trucks on Ford F 550 Super Duty chassis. The Toronto-based firm's flagship Sentry model, now with a new pickup version, is a bristling knife-drawer of angles and vertices that loudly proclaim the truck's road-clearing intent. 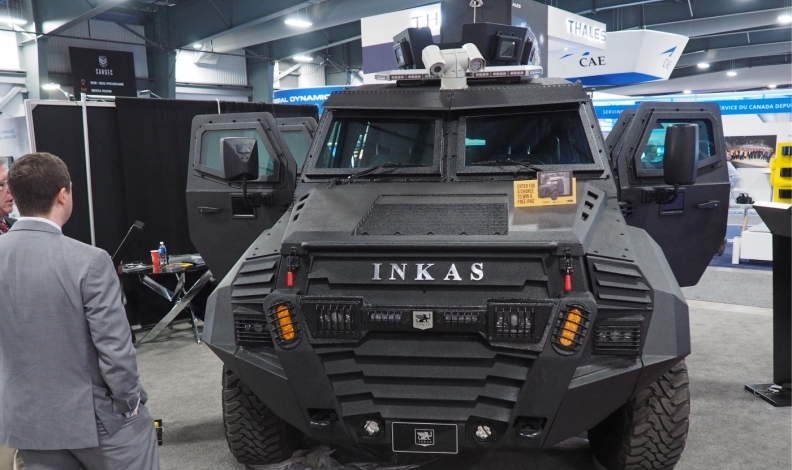 "People say, 'This is what I want to drive in the zombie apocalypse,’” Inkas Marketing Vice President Arthur Yurovitsky told Automotive News Canada at a trade show in Ottawa. While a few units have already been delivered to an unspecified South American buyer, the Sentry MPV pickup got its official launch this week at the CANSEC defence and security trade show in Ottawa. Military and police remain the prime target market, but Inkas also hopes to expand civilian sales with the MPV. The new model is up to 18 per cent lighter than the long-roof Sentry APC that debuted in 2015 and typically weighs 8,100 kg. Both are built on the Ford F-550 Super Duty chassis with 6.7-litre Power Stroke diesel engine, six-speed automatic transmission and dual-range four-wheel-drive. Run-flat tires and upgraded suspension are standard, and buyers can opt for such extras as a rooftop turret, side gun ports, night vision and signal jammers. The display model, outfitted to BR7 ballistics standards to protect against armour-piercing bullets, carried a list price of US$300,000. Yurovitsky said Inkas heard "a lot of requests from clients" for a pickup version with the flexibility to carry drones or accommodate a large antenna. Still, he expects the original APC to remain the biggest seller because of its greater seating capacity – up to 10, compared to the pickup's six. Inkas now produces between 40 to 50 vehicles a month, including Sentrys, larger APCs and armoured conversions of cars, vans and sport-utilities, at its 350-employee Toronto plant. . In looking to boost civilian interest in the Sentry, the vehicle is following in the wide tire tracks of the U.S. military High Mobility Multi-Purpose Wheeled Vehicle or Humvee, which became publicly available in 1992 as the Hummer H1. While they may be similar in size and go-anywhere philosophy, the two share little beyond an upright two-piece windshield. With carefully finished surfaces and Ford seats and instrument panel, the Sentry's cabin is far more comfortable than the rough-and-ready Hummer. And the aggressive, multi-faceted exterior – coated in a special Rhino Linings blend – shows a focus on styling that was never a consideration for the military vehicle. "We have a few automotive designers in house," said Yurovitsky.